It was a great idea, until it wasn’t. Minnesota’s Republican legislative leaders have launched a clever, and useful social media effort to rally public support for returning the state’s growing surplus to taxpayers. Minnesota’s February budget forecast projects that surplus adds up to $1.23 billion and growing. The surplus is the result of the state’s growing economy and newly enacted tax increases passed by the Democratic controlled legislature and signed by Governor Mark Dayton in 2013. “State government does not need this money. Minnesota families need this money. So, let’s give it back,” said GOP House minority leader Kurt Daudt. In that simple declaration, a campaign was born. 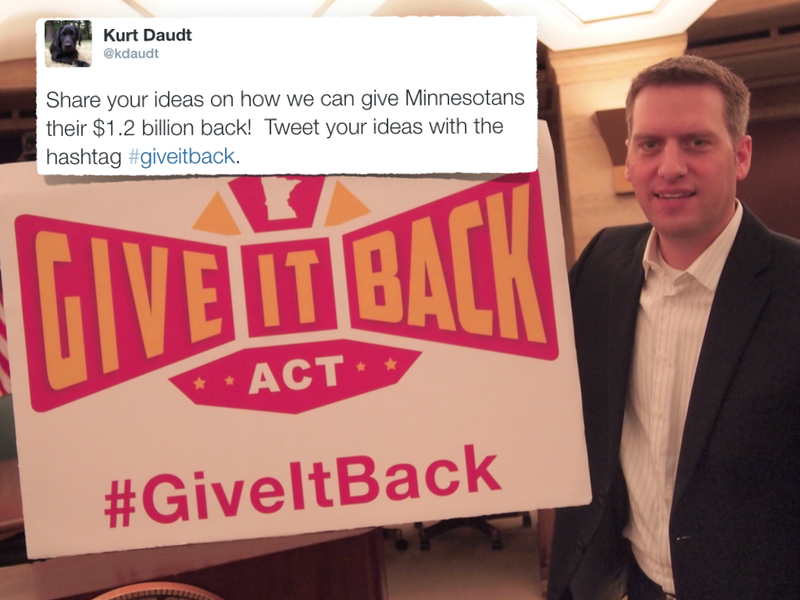 Republican leaders raised a poster before TV cameras with the words “Give it Back Act” and instantly encouraged citizens to Tweet their ideas about how the state should return their hard earned money by using the simple hashtag #giveitback. On many levels, it’s a smart strategy. From a pure marketing point of view, by launching a social media campaign based upon the Republican core value of lower taxes, legislative leaders could hope to not only activate its base of brand loyalists, but create a populist buzz and use the groundswell of public opinion to influence the Democratic majority to return some or all of the surplus to taxpayers in the form of tax credits or reductions. 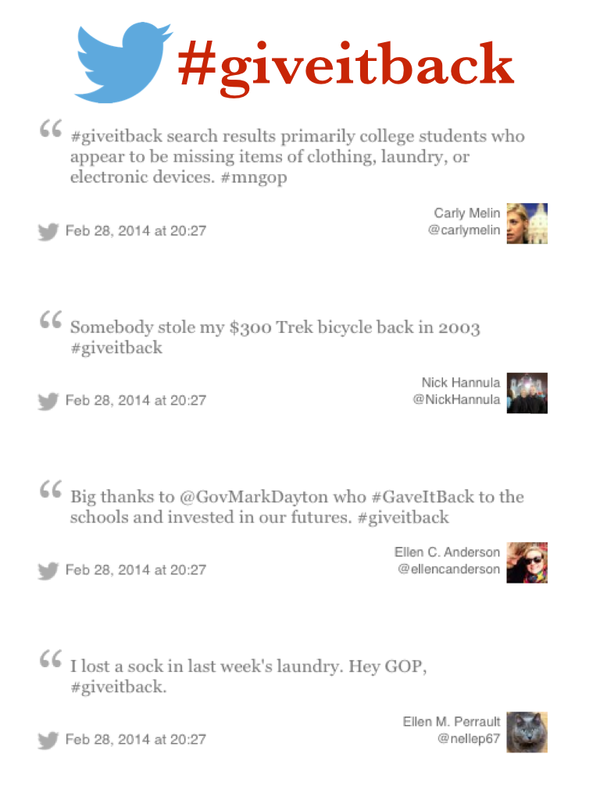 Figure 1 – #giveitback Tweets. Twitter campaigns can be risky at best. Unless a brand has a substantial base of loyalist or followers, its message can be undercut by critics and cynics alike with just a few clever Tweets that are retweeted among their own followers. That can add up fast. Researchers at the Korean Institute of Science and Technology have found that a retweet reaches 1,000 additional viewers on average regardless of how many followers the sender has. Complicating the strategy is the fact that it’s launched in a hyper-political election year where opponents and detractors have extra incentive to disrupt the message. These kind of campaigns require research. Brand managers need to vet the hashtags which can be easily done with simple tools embedded on Tweetdeck and Hootsuite. Advertising and PR agencies have more sophisticated tracking tools that can also aid in the research. 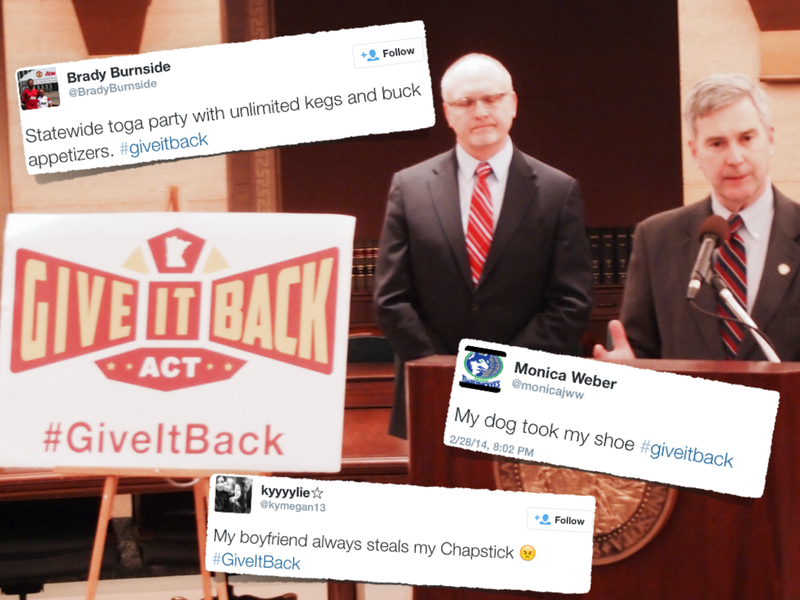 A simple search of #giveitback Tweets indicates that it’s a popular hashtag among teens and millennials looking to retrieve stolen items. Figure 2 – Justin Bieber’s #giveback campaign. Pop superstar Justin Bieber has even used a variation of the hashtag, #giveback, and many of his 50 million followers use it in their own Tweets. (Figure 2) Therefore the Republicans’ #giveitback campaign is co-mingled with hundreds of non-related Tweets and gets lost in the noise. In this case a more effective hashtag would have been one that is more specific, such as #returnthesurplus, or #returnmymoneymn. With research in hand, a smart campaign also needs a cross-channel integration plan. In other words, it needs to be leveraged on a branded website, Youtube, Facebook, earned media, and perhaps even paid media. An excellent example is how Toyota recently created cross-channel tactical support to drive Twitter conversations during the Super Bowl to create awareness for its new Highlander SUV. It’s not that #giveitback was a bad idea. In this case it made headlines and good news copy in the context of the budget surplus narrative. And yes, there is exceptional value in that too. But as a viral social media campaign it so far has been a swing and a miss.